Cost controls remain a competitive advantage, but a legion of short sellers continues to hold the stock down. Don't expect that to last much longer. 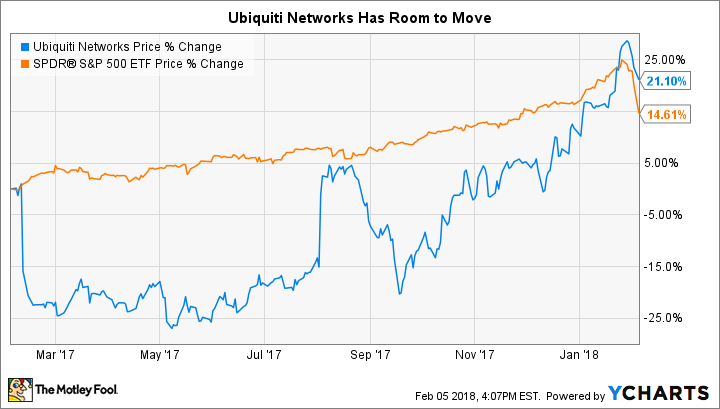 Shares of Ubiquiti Networks (NASDAQ:UBNT) have outperformed the S&P 500 over the past year, but not by much. Investors still aren't sure if the wireless networking specialist will find consistent growth. I think they're misunderstanding the company and founding CEO Robert Pera. Pera has long been known for his unconventional approach. Instead of investing heavily in a direct sales force to reach large companies (i.e., "enterprises") with wireless gear, he's banished admin expenses from the income statement to boost profit margins. As Pera sees it, the key to winning long term is to let low prices and superior products sell themselves once customers discover them. Ubiquiti Networks is profiting from connecting the world, wirelessly. IMAGE SOURCE: Getty Images. A little more than three years ago, Ubiquiti made a concerted push to sell to larger companies to safeguard itself from the volatility that comes with selling to wireless service providers and telecoms that drag their feet when it comes to network upgrades. Impressive growth followed, and the company has since grown its enterprise business from what once was a meager 20% of sales to over 50% as of this writing. Gross margin has remained stable throughout while net margin has increased. Therein lies the beauty of the model. By keeping costs low -- sales and general expenses don't even crack 4% of sales now -- margin keeps expanding, and returns on capital (24%) and equity (48.5%) remain healthy and strong. Ubiquiti Networks looks like the perfect business in almost every sense. So what's the problem? History. Investors can't seem to get past the company's business model. Selling wireless gear and accompanying software seems too vulnerable as if heavy-weight competitor Cisco Systems could disrupt the company at any moment. Over 10% of the shares outstanding are sold short as a result, holding the stock in place despite good results. What do I mean by good? Revenue grew 20.1% while adjusted earnings per share rose 16.5%. By contrast, direct industry peer Netgear (NASDAQ:NTGR) grew revenue just 5% and saw profit decline 1.5%. Putting an even finer point on it: Netgear spends over 15% of sales on SG&A and recorded a net margin of 5.8% last quarter. Ubiquiti spent 3.7% on SG&A and recorded a net margin of 30.5%. Cost discipline has become a competitive advantage. So what should we expect for the rest of 2018? We'll know a lot more soon. Ubiquiti Networks reports earnings for the fiscal second quarter ended Dec. 31 on Feb. 8 before the market opens. What to expect? According to S&P Global Market Intelligence, analysts are looking for $0.89 a share of earnings and $239.89 million in revenue. Both figures would signal meaningful growth, with EPS up 23.6% and revenue up 12.3% year over year. Yet those estimates could be conservative. Ubiquiti Networks has outperformed EPS estimates in three of the past four quarters, with November's results coming in a whopping $0.10 ahead of the consensus. The company has also beat on the top line in each of the past four quarters. Thursday's call will hopefully deliver more of the same for patient investors.